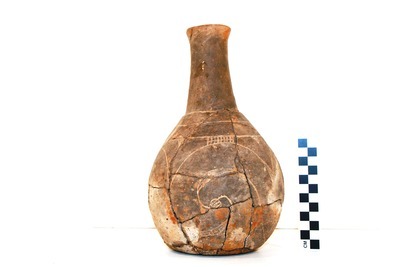 "41CP12, Burial 6, Pot 2" by Timothy K. Perttula and Robert Z. Selden Jr.
DECORATION: The top of the vessel body has three horizontal engraved lines; the lowermost line has alternating small hatched pendant triangles and cross-hatched pendant rectangles. The body has curvilinear scrolls whose arms curve around each other and meet at a small central excised circle. The upper and lower arms of the scrolls begin at the apex of upper and lower triangular elements. There are widened excised areas on each arm of the scroll, opposite the central excised circle. Wilder Engraved, var. Wilder bottle, Burial 6, Pot 2.